The Dean, Professor Janet Jones, introduces the School. The School has an established track-record of delivering courses that offer core academic knowledge alongside applied professional knowledge. This approach ensures our graduates have the right skills and competencies to compete successfully for jobs, and have the potential to lead innovation within their sectors. We offer courses at the forefront of creative thinking and multimedia convergent practice, developing interdisciplinary interests that bridge technology and creative practice. We understand the importance of the digital age, and within LSBU we have internationally recognised research excellence in science and technology. This, combined with our strong and deep heritage in design, performance, media and the visual arts, positions us at the important strategic intersection between technology and the liberal arts. Additionally, our central SE1 location ensures we have a wide range of internationally renowned creative industry partners at our doorstep. We work with some of the capital’s major art, media and performance institutions through collaborative grants and research funding. Our students graduate as bi-lingual ‘artist-coders’, leaving with a deep understanding of the converged digital environment. We’re reinventing the way we communicate with each other and with our audiences across all media as everything in the world is digitised, programmed, curated and made available online. As a result, more people are employed in the exhibition, distribution, consumption, criticism and analysis of media and performance than in producing the direct product. This is what we teach: a fundamental shift in the nature of media and performance. 80% of our research in media and culture was awarded 3* out of 4* - 'very considerable impacts in terms of their reach and significance' - by the Research Excellence Framework (REF) 2014. Elephant Studios, our multi-million pound studio complex, offers facilities at the forefront of digital technologies and multimedia practice for creative students. 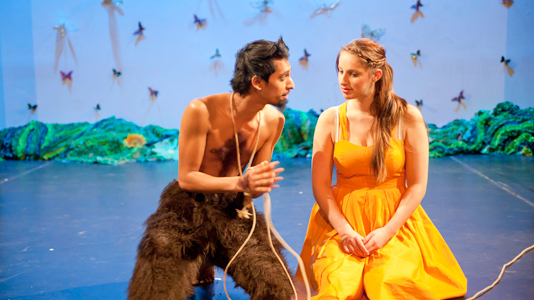 We are the only campus university in London with its own theatre and studio for sole use by students. 100% of our drama students were in employment or full time study six months after graduating. We currently work with over 50 local, national and international arts and creative industries partners, integrating these organisations into the learning and teaching within the School, with innovative teaching models that bring industry practice and live briefs into the classroom. The South Bank Photographers’ Collective is a nationally recognised, dynamic creative agency offering students the chance to work on high-level industry briefs. We run our own internationally acclaimed Art Gallery (Borough Road Gallery). Our newly launched research centre for the networked image aims to be a world leading research group for new knowledge and understanding of the digital image in computational culture. Attracting a new generation of scholars as well as gaining affiliations from leading and established experts in the field, it encourages transdisciplinary approaches from both the arts and sciences, and collaborates with partners in the cultural industries on real world problems. The newly formed School draws upon a long tradition of creative and intellectual histories within the University. The most recent history dates from the formation of an Arts and Media Department in 2000 within the Faculty of Arts and Humanities. The Department combined the best of media sociology with the emerging digital media practices, which saw the creation of some of Britain’s first dedicated and pioneering undergraduate digital media degrees. By 2009 the Department had expanded further into drama, performance and creative writing as well as strengthening its offerings in journalism and arts management. Such growth led to the creation of two departments: Arts and Media; and Culture, Writing and Performance; which are now happily brought together in the new School. The School also draws upon a much long tradition of practical arts at LSBU, the most famous of which was reflected in the teaching of the artist David Bomberg. Together with some of his students, Bomberg founded the Borough Group of Artists in 1954 which is still reflected today in the work of the School’s Borough Road Gallery. The School also draws upon the significant and groundbreaking development of media and cultural studies within sociology from the mid-1990s, which underpins the School’s highly-prized research profile.